Oh, how I wish I had watched TV instead of playing this! ...Well, not really. 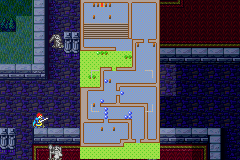 We enter the map on the bottom. 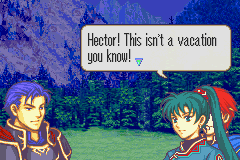 Hector: Where's the root booze? And what about the HD TV? Yeah! Although, actually guys, I'm gonna be gone for a week starting this friday because I'm going on a vacation. 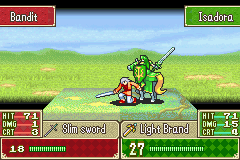 Hector: Hmph. Doesn't mean we can't try to make it as tolerable as we can. Right Eli? 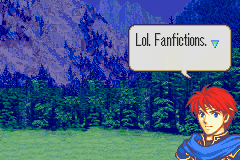 Eliwood: Right, but... Lyn has a point. Where would we find an HD television? Hector: There's gotta be one in here somewhere. Too bad it's so mango dark that I can't see more than three spaces ahead of me. What? Is this how it works? You just go up to a random building: "THERE'S GOTTA BE A TV IN HERE SOMEWHERE"! 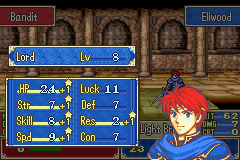 Eliwood: ...Wait. Did you just say you can't see more than three spaces ahead of you? 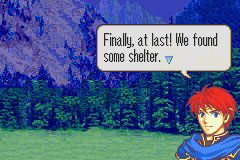 Eliwood: Oh no pizza. 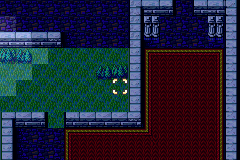 That means this is a fog of war stage. I hate these stages. Oh dear. 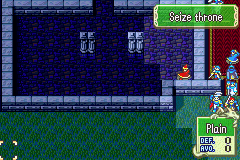 It would be entertaining if it had an objective like "FIND THE TV", but no, this is a seize throne mission. If I was working on Fire Mumblem today, I would take that comment to heart. 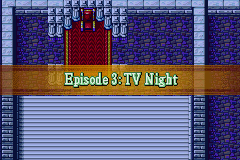 Episode 3 would have a TV "unit" that you have to "talk" to in order to complete the chapter. Oh, right! You might have noticed the new arrivals! 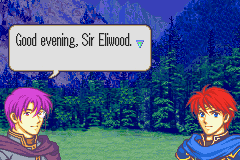 Eliwood: Serra? When did you arrive? Serra: Five minutes ago. 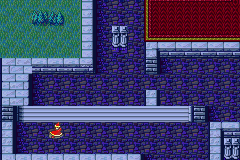 I nagged Erk to drive me here! Wait, why don't they all just drive to a motel or something? Come to think of it, what is even their OBJECTIVE? Are they really just running around killing everyone in their path? 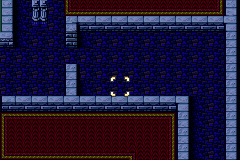 Old Fire Mumblem doesn't really have a plot, which makes sense since it was just me testing the waters and experimenting. It's not until Revised Edition that there is some indication of "purpose". Eliwood: I see. Good thing too. We really need a healer anyway. Our vulneraries are running low. 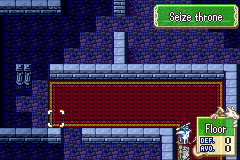 Serra: I'm the cleric for you then! 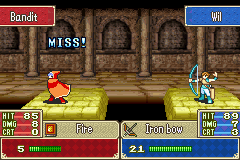 Eliwood: Ah! Canas. Good to see you here. 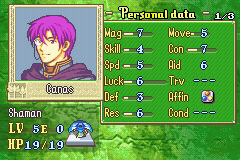 Canas: Thankies. 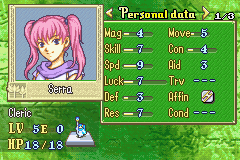 I helped Serra nag Erk to drive us over here. Of course, I would've always used my trump card. 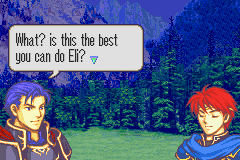 Eliwood: And what is that? 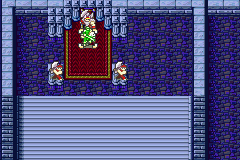 Canas: Oh? 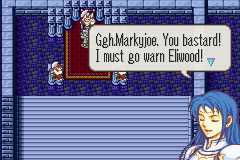 You don't know Eliwood? I didn't even NOTICE until now! SUCH A PLOT TWIST! 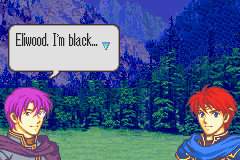 Eliwood: WHAT DID YOU SAY, CANAS? 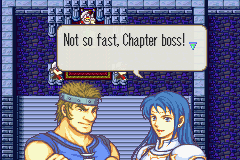 Canas: I'm just as surprised as you are. Indeed. Trust me, everyone, it gets worse. Much. Worse. This scene... is a very pivotal moment in my hacking "career". I'm gonna speak to BuringPenitentEngine. If he gives me the okay, I'll post a bit of history and what happened when I released this Episode to BuringPenitentEngine. For now... happy thoughts. 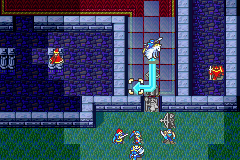 Then we scroll up to Bartre, who has deployed thieves-uh, I mean, glitched fighters! 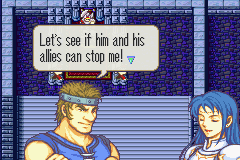 Bartre(??? ): Damn! They must want my new HD television! Good thing I have a large army to keep them away! Troops! Move out! I'll be watching TV. The new episode of Scrubs is on! 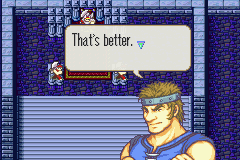 Bartre(??? ): Lol pal, unless you don't want bacon, I suggest you Go out there and stop them from taking my HD TV! Understood? 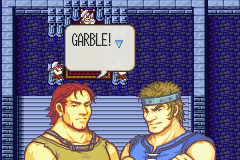 The Dorcas's actually move up and down while saying "GARBLE". It's kinda funny. Kinda funny!? YES! That means I've won the "Kinda Funny" award!! 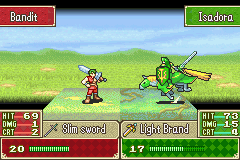 Suddenly, a green paladin rides in! Through, uh, the back door I guess! WHO COULD IT BE? 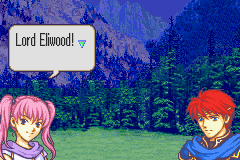 Isadora: I cannot allow you to harm Lord Eliwood! 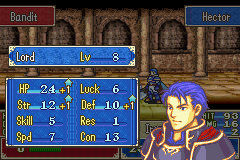 Bartre(??? ): Get outta here, Isadouche. Not even this MOD would make YOU a decent character. 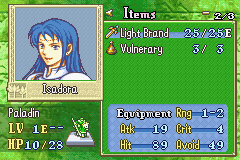 Isadora: We'll see about that! Wow Marky, what a great way to subvert our expectations! Why is it HIS fault? 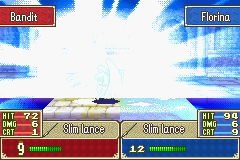 You're the one who brought a Light Brand to a Swordslayer fight, and then used it at 1 range! 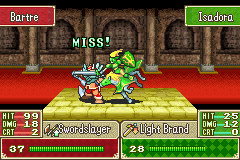 Who gave her that weapon and programmed her to fight him? And then she flees to go sit on a forest. I don't blame her, heading all the way to Eliwood's group could take YEARS. 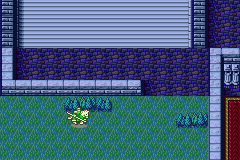 Enemies spawn everywhere, then fog sets in and it's time to start! 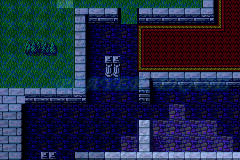 Yeah, there's obviously some horizontal room I didn't show, but THIS is what I have to walk through! Four screens of PAIN! And it makes me trek plenty of horizontal distance too! The map is so big, you can't even see it all at once on the start screen! 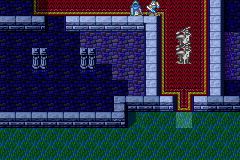 One of the first ever "Long Winding Path" chapters in FE hack history, and unfortunately, far from the last! 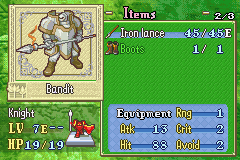 The one knight we can see has BOOTS! 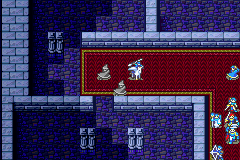 Basically, the gimmick of this chapter is that all the side-corridors have knights in them, and all the knights have goodies on them! So yeah, you have to dispatch teams down those passages or miss stuff! Fun! 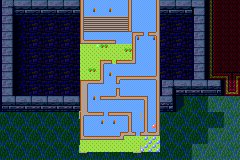 Remember when I said map changes were really hard while I was working on this? 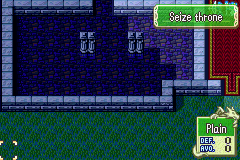 Originally, I wanted the chapter to have treasure chests. 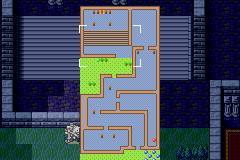 Problem was, map changes were only doable with a hex editor, and I found it very confusing. So I did this instead. 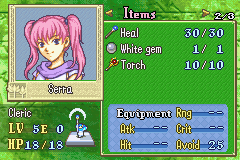 Serra is our healer, which we will definitely need. 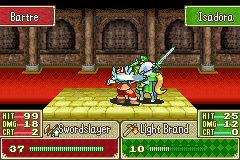 I think she got buffed, because she was getting actually good levels when I was using her, and she has a Torch, which will be very helpful during this chapter! And no, I will NOT do the Torch Glitch. At least...not yet. 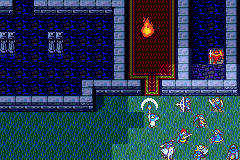 I know of many glitches in FE7, but what is the Torch Glitch? 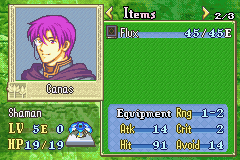 Canas is our resident ethnic minority unit, who is of course a shaman, a class typically associated with dark magic, which itself is associated with evil. 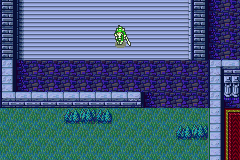 There's not that much to say about him, except that Markyjoe is totally racist..
Florina has been buffed as well, and she has a poison lance. That's all I have to say. 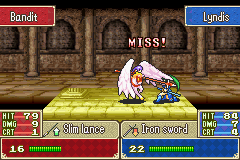 She's still injured, and she has bad stats and an okay weapon. I'll explain more about her as we go. I know those aren't, like, Marcus-level stats, but they're still pretty good. 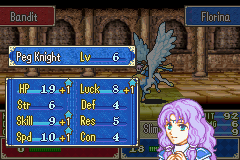 If I remember right, she also has really good weapon ranks to boot. Certainly one of the more viable units in this hack. A...wall of PEG KNIGHTS? What? Gotta balance da gaem so Wil is gewd, man. Actually, I have no idea what I was thinking. Well, they don't last long! 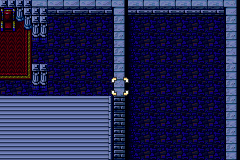 And yes, Wil got ANOTHER terrible level. Alright. Let's put this Wil thing to rest once and for all. Just what exactly did I change about Wil? 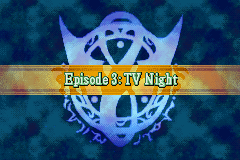 Let's check the growths in Nightmare! Are you serious, Past Markyjoe? Are you freaking serious!? 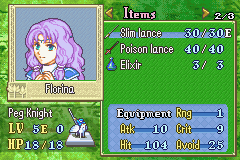 No, really, I killed an enemy and Florina could move again. She doesn't display this power later on, so...yeah. 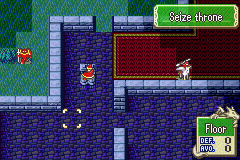 The only thing that could explain it is that Florina happens to be on the spot Serra nailed with her torch, and if that's actually what caused this, then someone needs to make a ragefest requiring the tactic. Note to self: Remember this LP for next Ragefest. Isadora starts chugging bell-shaped things which may or may not be medicine. Intelligent! 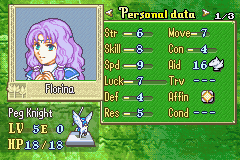 Florina accidentally lures out some mages! Oh hey! 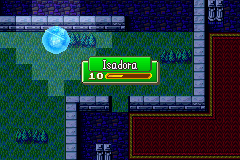 So, this is the main threat to Isadora. A myrm and a merc come every turn and assault her with the brutal power of their slim swords. We have to get there before they take her down! 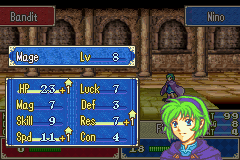 Nino is gonna be a SPEED DEMON! Y'know. 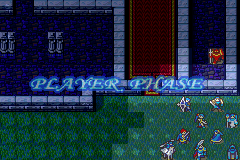 In my recent Aria of Sorrow stream, whenever I asked out loud for something to happen, it happened. This is very coincidental. More reinforcements! Gah, I want to know what's COMING from down there! 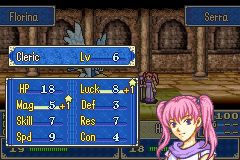 Wil, you put three levels into basically gaining JUST SKILL, and then you MISS ANYWAY. 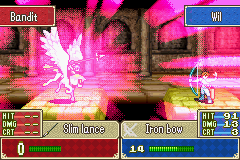 I don't think it's POSSIBLE for a unit worse than you to even EXIST! Based on the data from before? 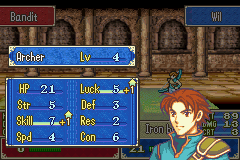 I have no doubt in my mind that Wil is the worst unit in this hack by leaps and bounds. 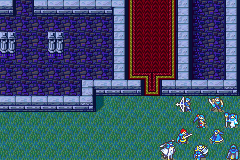 Oh, the reinforcements were peg knights! COME TO ME, MY BEAUTIES! More reinforcements up there. This continues for a while. He's thwomp I tell you! Gasp, a stat that isn't skill. Serra lays down another torch. 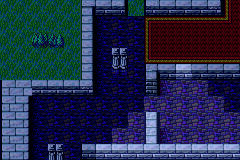 Honestly, for being so huge this mansion is SHOCKINGLY empty! 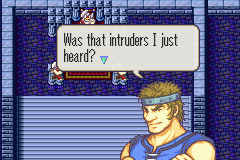 Bartre does not have many belongings. 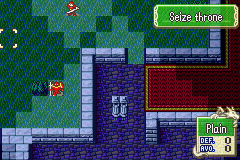 The knight has some money! 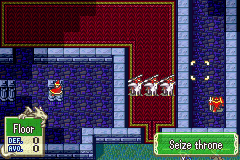 I think that was more reinforcements. 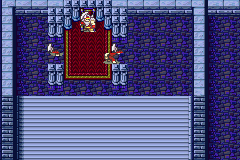 Ah crap, I sent Raven to check out that room because I didn't expect anyone to actually be in there! 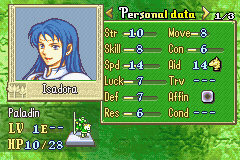 Isadora's holding up pretty much fine. 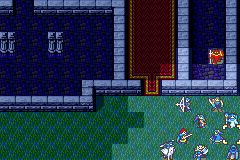 So, yeah, Lyn's far ahead of everyone else, and she's BARELY made it halfway. 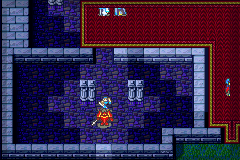 We've had to split into groups, some to gold off the pegs, some to push forward, and Nino to explore that really long hallway with the Boots knight. DO HER AND HER BEAUTIFUL HAIR SURVIVE?